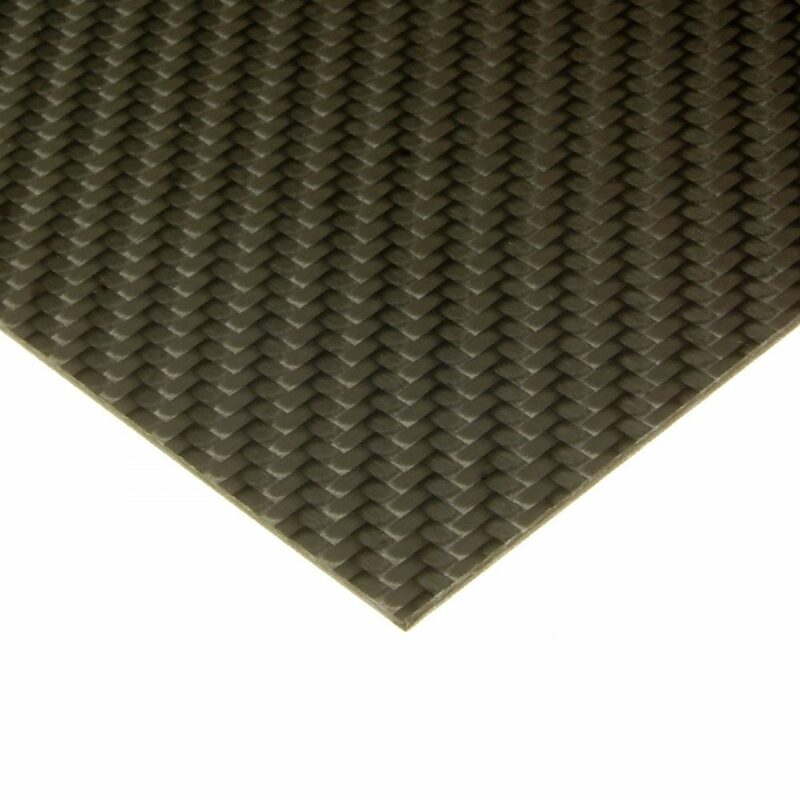 Custom cut FLEXIBLE 0.25 mm carbon fibre sheet. Ultra-thin smooth glossy FLEXIBLE carbon fibre sheet is manufactured using 100% genuine carbon fibre infused with epoxy resin and backed with a pressure sensitive 3M adhesive. Custom cut FLEXIBLE 0.5 mm carbon fibre sheet. 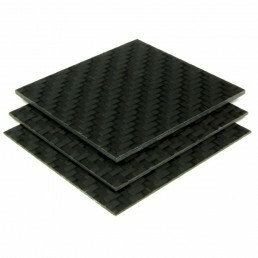 Thin smooth glossy FLEXIBLE carbon fibre sheet is manufactured using 100% genuine carbon fibre infused with epoxy resin. Select your required thickness and custom length and width from the menus below. These custom cut smooth glossy FLEXIBLE carbon fibre sheets are manufactured using 100% genuine carbon fibre infused with epoxy resin. The FLEXIBLE 0.25 mm thick carbon fibre sheet is an ultra-thin sheet possessing paper card like stiffness, translating into an ultra flexible thin sheet with the ability to conform to the tightest of curves (~10 mm radii) or tubes as small as 35 mm diameter. This flexible sheet will need to be mounted to a rigid backing material and is not recommended for structural applications or wrapping compound curves. Our FLEXIBLE 0.25 mm thick carbon fibre sheets are supplied with high quality 3M pressure sensitive adhesive film for mounting of sheets to backing surfaces. The FLEXIBLE 0.5 mm thick carbon fibre sheet is moderately flexible and has the ability to conform to very gentle curves whilst at the same time possessing moderate strength and stiffness. Our customers often use this for decorative veneering applications with a flat surface such as door cards. It requires additional backing support to maintain its shape. For advice on selecting the correct thickness please check out our Thickness Selection Guide. 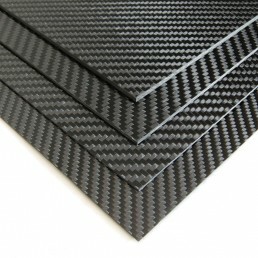 Our FLEXIBLE 0.5 mm thick carbon fibre sheet is created from multiple layers of high quality 2/2 twill 3k weave carbon fibre with an areal density of 240 gsm to create a classic carbon fibre look. The sheet possess a mirror like gloss finish on one side and a matt finish on the other to enable optimum bonding. The gloss side of all our carbon fibre sheets are covered in a removable protective film that will help prevent marking/scratching and maintain the glossy surface finish when you’re cutting and finishing the sheet for your application. 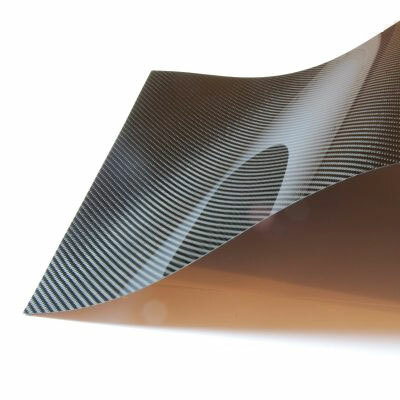 Note 3M pressure sensitive adhesive is not supplied our FLEXIBLE 0.5 mm carbon fibre sheets. Automotive: Interior trim pieces, dashboards. Dimensions: Available in various sizes up to 2440 x 1200 mm +/-2.0 mm. Our FLEXIBLE carbon fibre sheets are 100% pinhole free and are a perfect choice for adhering to smooth flat and curved surfaces. Our sheets produce a sleek, flawless, sophisticated look with amazing depth that we guarantee cannot be bettered. These ultra-thin carbon fibre sheets can be cut with standard tools including scissors, craft knife, guillotine or scalpel where you must always wear appropriate eye protection when cutting. Finally, for more information check out our Composite Cutting & Finishing Guide in our Technical Support pages.